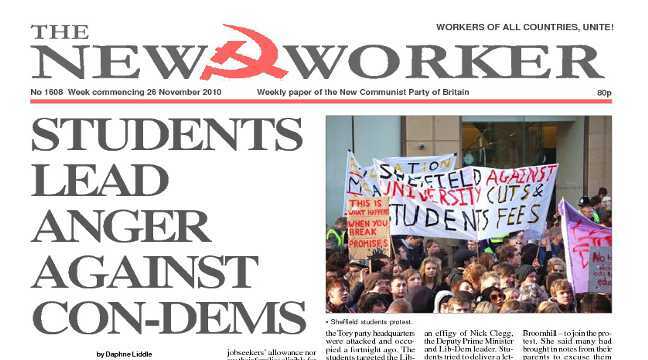 www.newworker.org | 26th November 2010 - STUDENTS LEAD ANGER AGAINST CON-DEMS! STUDENTS took to the streets again in huge numbers throughout the country to express their anger at broken promises and Con-Dem plans to raise tuition fees to up to £9,000 a year. Full support for DPR Korea! DEMOCRATIC Korea has responded to south Korean artillery fire by shelling a puppet marine base in the most serious border clash since the end of the Korean War. The Blairites are crawling out of the woodwork following reports that Labour has now taken the lead over the Conservatives in a number of opinion polls. Ludicrously they claim that Labour has to cut its links with the unions to make it more electable, even though if a general election was held next week Labour would certainly win it. These people are demanding a return to the discredited anti-working class policies of Blair & Co and even calling for a cut in income tax — which even the Coalition Government dare not propose at the moment. All of this may be music to the ears of the ruling class but it will do nothing to consolidate Labour support amongst its core working class vote.